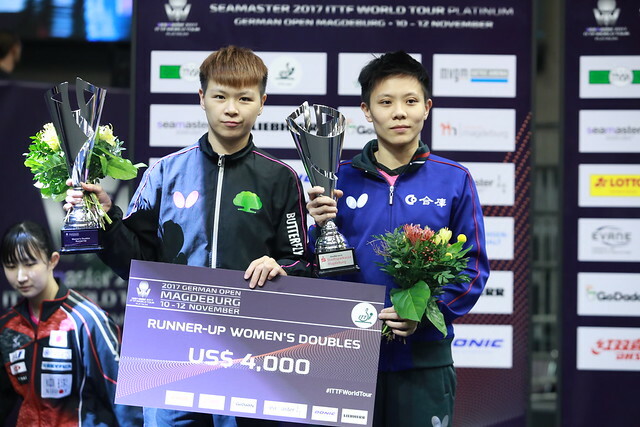 A narrow defeat for Japan's Miyu Nagasaki in her concluding contest in the Women’s Singles qualification tournament for the Seamaster 2017 ITTF World Tour Platinum German Open in Magdeburg on Wednesday 8th November; however, for the 15 year old it was all’s well that ends well. She finished in first place in her group, to be one of only two players to be assured of a place in the main draw. A total of 30 groups in the qualification tournament, only those in the first two groups gain a place in the main draw to join the 16 seeds; the players finishing in top spots in the remaining groups must compete in a preliminary round. Listed at no.102 on the current Women’s World Rankings, Miyu Nagasaki was beaten in a full distance seven games duel by Li Jie of the Netherlands, ranked no.16 (9-11, 11-7, 11-7, 12-10, 8-11, 7-11, 11-5) but it was sufficient to secure pole position. One day earlier, Li Jie had suffered a shock six games defeat at the hands of the host nation’s Nina Mittelham, named at no.90 in the global order (6-11, 14-12, 7-11, 11-5, 11-8, 11-4). However, in the opening match in the group, Miyu Nagasaki had recorded a five games success over Nina Mittelham (11-4, 11-9, 13-11, 6-11, 12-10). Thus games ratio determined the outcome. It was first place for Miyu Nagasaki (7:5) followed by Li Jie (6:7) and Nina Mittelham (5:6). A place in the main draw assured for Miyu Nagasaki, the one further player to gain the distinction was Hong Kong’s Doo Hoi Kem. Presently listed at no.18 on the Women’s World Rankings, the highest rated player in the qualification tournament, having beaten Spain’s Galia Dvorak (11-8, 11-7, 11-7, 11-5) on the opening day of action, she concluded her group phase encounters with success against Chinese Taipei’s Lee I-Chen (11-5, 8-11, 8-11, 11-4, 11-5, 11-3). First place in the group contrary to expectations for Miyu Nagasaki, further down the order, there was also one further Japanese player who upset the odds. Misuki Morizono beat Singapore’s Yu Mengyu (11-4, 11-2, 11-7, 11-8) to complete her group phase matches unbeaten; the preliminary round now awaits. Presently on the Women’s World Rankings, Yu Mengyu is listed at no.37, Mizuki Morizono at no.70. Play in the main draw commences on Friday 10th November.